Here's an interview with Yamaha USA's chief brass design guru Bob Malone, talking with Toronto trumpeter Chase Sanborn at the Yamaha Artist facility in New York. The full video is included in Chase's DVD "Brass Tactics" which comes free with his "Jazz Tactics" DVD. Visit Chase's website at www.chasesanborn.com. Terry Warburton had started over from scratch before. But on June 29, 2005, the founder and president of Warburton Music Products redefined "from scratch" while redefin­ing perceptions about the limits of his inner strength and ability to persevere. Around 1 A.M. he was awakened by a call from friend and business partner Ken Titmus. Warburton's home/shop was on fire. The fire department had already been summoned, and Warburton jumped into his car to make the five-mile drive from his fiance's house. Still two miles away, his stomach knotted as the night sky was painted with an ominous red glow.At first comforted by the sight of fire­men already on the scene, Warburton soon noticed they were just standing around, waiting for the arrival of a water truck. Shocked that they hadn't known there were no hydrants in the rural out­skirts of Orlando, and dismayed as the fire, initially isolated, was spreading, he asked if he could at least turn a garden hose on the flames. A policeman told him he'd be arrested if he tried. In what he describes as a Keystone Cops per­formance, 11 fire trucks jammed the small dirt road, and one that had slid into a ditch had to be moved before the late­coming water truck could get close to the now fully engulfed structure. By first light it was clear that his entire 5,000-square-foot home and shop had been consumed by the blaze. (Like Warburton, Titmus lost virtually every­thing he owned, walking away from the fire with only a pair of jeans and his trumpet!) Machines that had taken him 25 years to accumulate-the last of which had been paid off only six months prior-were reduced to charred and melted hunks of metal. The person­al losses were even harder to take. Thousands of pictures of his children on his computer-and on the backup lap­top, which just happened to be left in the office that night-were gone. So were his extensive gun and knife collec­tions, his library, and, worst of all, his departed parents' cremation urns.When one of Warburton's employees showed up for work that day, she tried to console him with advice he'd always given his team-"Be happy for what you have, not sad for what you don't have"-but then she blurted out, "But you don't have anything!" "But I told her that I had a lot of good friends, the knowledge in my head, and the desire in my heart, and that we would be back in business as soon as I could make it happen." More than just comforting words, Warburton's promise would become prophecy. His new 2,500-square-foot facility in Oviedo, Florida, produces a wide range of mouthpieces for trum­pet, flugelhom, piccolo trumpet, cor­net, French horn, trombone, and tuba. Representing an eclectic group of acclaimed symphonic, jazz, and pop musicians, Warburton endorsers speak of the mouthpieces' efficiency, clarity, versatility, and consistency throughout the range of the horn. Many claim that a Warburton mouth­piece has improved their playing. They are sold by a strategically limit­ed network of dealers in 35 states as well as in Canada, Europe, Asia, Australia, and Brazil. Terry Warburton's capacity to recov­er from the 2005 fire's devastation may have resulted from condition­ing---or tempering, as it were-and a long history of "two steps forward, one step back." In 1974 the then 24­year-old Ontario native received a loan from his parents to start the first Canadian factory dedicated solely to making brasswind mouthpieces. Over the next five years he established two band instrument stores in Toronto and Hamilton. In 1979 Bob Giardinelli, owner of the famous Giardinelli Band Instrument Company and a mouth­piece maker since 1947, asked Warburton to run his mouthpiece operation in New York. Already antic­ipating his retirement, Giardinelli planned to have his nephew, Ralph, and Warburton run and jointly own. the company. He leaped at the opportuni­ty to work with his longtime friend and become part of larger North American band instrument business. However, constant travel and the strain of running his mouthpiece busi­ness, his two stores, plus the Giardinelli operation proved unten­able, and within a year he was out of business entirely. No longer tied to Toronto, Warburton opted to start over again in Fort Lauderdale, Florida, where music retail­er Rancelear Kay allowed him to set up shop in the back of his store. Slowly, painstakingly, Warburton crafted new hand tools one piece at a time and invested his last penny to buy a used lathe so he could resume manufacturing mouthpieces. In 1986 he sold a 50% interest in Warburton Music Products to trumpet player Mike Padula, who owned a machine shop in Orlando. In addition to a much-needed cash infu­sion, the relationship prompted Warburton to explore the use of CNC technology for mouthpiece manufactur­ing, an industry first. Four years later he bought back Padula's interest in the company and relocated his home and business to the initially idyllic, but ulti­mately doomed site outside Orlando. Almost nothing was salvageable after the fire. Nine CNC lathes, a dozen man­ual lathes, a custom-built trumpet lead­pipe-drawing machine, and a bell-spin­ning lathe were reduced to the 65,000 pounds of scrap steel and brass. "It was a painful experience to go out there every day and sift through the mess, hoping to find anything of use or value," Warburton recalls. But from the ashes of what seemed complete devas­tation, a few small items of huge signif­icance survived. Warburton found the mouthpiece celebrated (and tragic) trombonist Frank Rosolino gave him in 1976 after he'd made him a new one. Warburton refinished the piece and it again sits on his desk, just as it had for all those years before the fire. The "arti­fact" that affected him most was a photo of his daughter, Erika Lin. "Her look said to me, 'Don't worry Dad, you have us.' That picture was the inspiration I needed to keep on going for weeks under the hot Florida summer sun. "The only piece of equipment to survive was a custom-made machine used to stamp the Warburton name on mouth­pieces. It was rebuilt with assistance from friend Ignacio DelCampo, who flew from Argentina just to help. In the months that followed the fire Warburton was the beneficiary of an outpouring of assistance, donations, and customers purchasing mouthpieces even though they knew it would be months before they would receive them. T-shirts emblazoned with "Warburton Fire Recovery Sponsor" were sold to raise money and given to these patient new customers as a thank you. After months of tough, depressing work, the site was finally cleared. 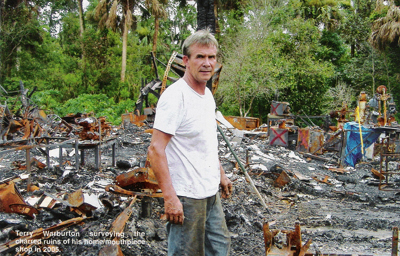 Because the shop had been at his home, Warburton had not been able to insure both the house and the shop's equip­ment, so when the insurance check finally arrived he had to decide between rebuilding his home or his business. Since he'd been living at his fiance's house anyway, he spent the entire amount on a new steel building and equipment to get Warburton Music Products back on its feet.But misfortune wasn't quite through with him. After the new $35,000 build­ing was erected he learned that because he no longer lived on the premises, zon­ing laws prohibited him from having it wired for electricity. The judgment came as "a real slap in the face," he recalls, "but instead of crying about it" he relocated to a rented building in nearby Oviedo. Equipped with new pro­duction tooling, a new CNC lathe, and expanded polishing and plating facili­ties, the company resumed producing Warburton brass mouthpieces and is again shipping them all over the world.In addition to expanding his mouth­piece line, Warburton has revived development of a new trumpet that was near production prior to the fire. (The first prototype is being rebuilt and will be kept as a souvenir.) His old friend Mike Padula is making some of the parts while Warburton is personally concentrating on the bells and lead­pipes. He expects to introduce the pre­mium-level horn, which he's been thinking about and designing over many years, in 2008. Meanwhile, demand for his mouth­pieces is thundering, and his craftsmen are scrambling to keep up with new orders, particularly custom-made mod­els, "all urgent." His business is at least as healthy now as it was before the fire.Though by nature an anti-whiner, Terry Warburton can't escape the occasional philosophical reflection. "It was a tough time to go through," he says, "but it made me look inside and see what I'm really made of. Quitting was simply not an option. Making mouthpieces has been my life and will continue to be as long as possible. "There are so many people to thank for my success in life, in business, and cer­tainly in this rebuilding process," he concludes. "They know who they are, and I just want to say to them, 'Thanks again-I won't let you down.' After 39 years in the music industry and 33 as a manufacturer, it will take more than a fire to stop Warburton Music Products."